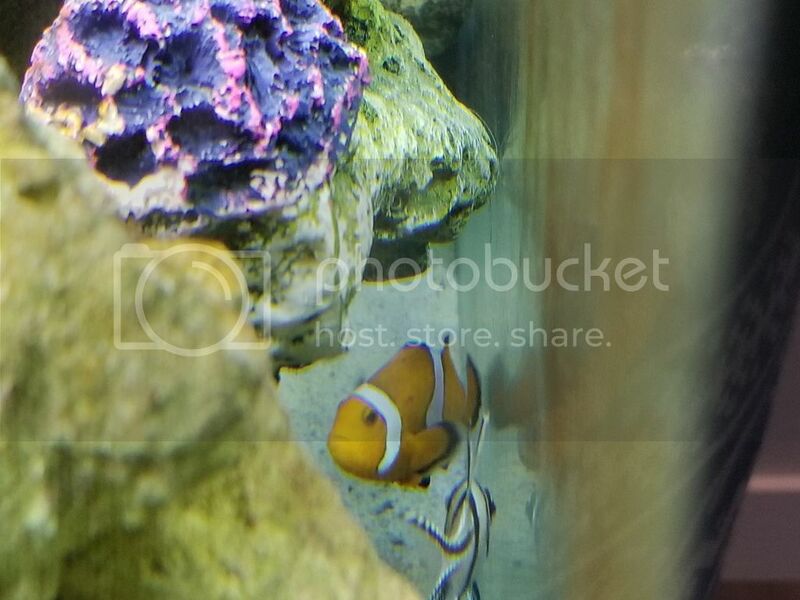 I found my clownfish with two reddish bumps on its side just behind the head. See attached photo. Any idea what this is and how to treat it? The aquarium is several years old, fish only, not a reef. SG is normal - 1.025, last fish was added about 5 minutes before noticing these spots. Before that, it had been several months. Fish are not quarantined, as this is a fish only tank. Behavior of the fish is normal, no noticeable changes, anyway. Fish ate yesterday just fine, and we haven't fed the tank yet today since noticing the spots. There are only two spots and this is the only fish with noticeable spots. Thanks in advance for any possible help! as an additional note, the photo makes the spots look brownish or even blackish, but in real life there is a real reddish tone to them. any advice would be appreciated. Thanks! Any nems in the tank? Clownfish will sometimes develop small black smudges which is the result of coming into contact with a coral or nem that is irritating their skin. The result is the condition known as Hyper-Melanization. no nems. no corals. fish only tank. could it be just spots from rubbing on some rock? That’s possible. It could also be bite marks from something. What fish did you just add? Yellow Candy Hogfish and McCosker's Flasher Wrasse, but I noticed the spots as I was putting the fish in the tank, so i'm 99% sure it wasn't them. I would just keep an eye on the red dots for now. Clownfish are pretty resilient.